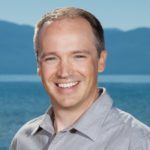 Lake Tahoe luxury real estate makes up 33% of all home sales in Q1 2018! 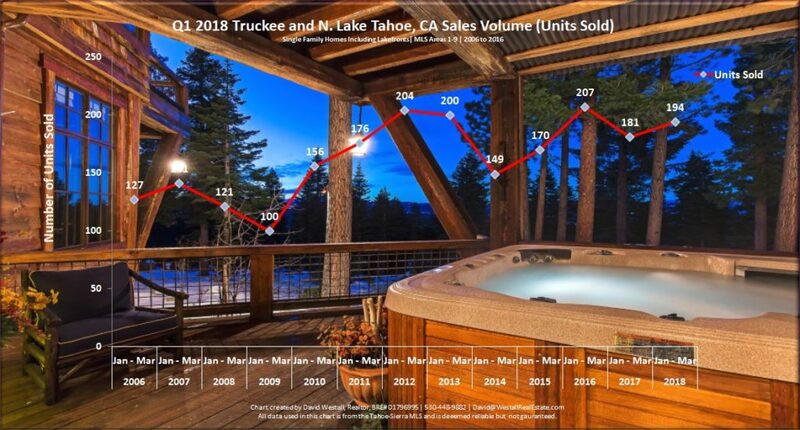 The first quarter of 2018 is showing strength in the North Lake Tahoe and Truckee real estate markets. 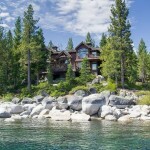 Buyers are making moves, especially in the Tahoe luxury home markets which have seen 40% more transactions over 2017. Just about every data point that I track is showing positive appreciation, which is fantastic going into the summer selling season as the first quarter stats will give buyers confidence with their purchase decisions. 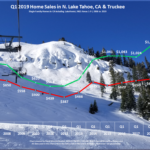 Total dollar volume for single-family home sales is at $226M which is 18% higher than last year and I see no issues with the North Tahoe markets exceeding $1B in sales for 2018 as more than 50% of our sales take place in the 3rd and 4th quarter. Inventory remains constrained at most price points, so buyers have fewer choices. Luckily, buyers see the value of the current inventory and are purchasing homes at a rate that is 7% faster than the same time period in 2017. In the first quarter of 2018, the average home price is up 13% and the median home price is up 3% which further supports the strength of the market. Buyers will struggle with low inventory levels, especially in the sub $550K price points. If you are shopping for homes below $600K you need to have a plan so that you can move fast when a quality property comes on the market as there will be a strong competition for these homes. 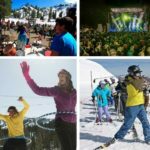 Now is the best time of the year to list and sell your Tahoe property. Discerning sellers are taking advantage of low inventory levels and are selling their homes quickly and for top dollar. In the last 12 months, there have been 1,243 single-family home sales which equate to 103.58 sales per month on average. 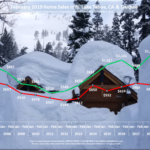 Currently, there are 201 homes for sale in the Tahoe-Sierra MLS which means that we only have a 1.9 month supply of inventory which shows that we are in a strong seller’s market. Undoubtedly, there is going to be a steady rise in inventory in the spring, which means more competition and will cause demand to soften. If possible, list your home now!